Moose Jaw, Can. - AP reports today that The Nobel Committee awarded Paul Krugman, the Princeton University scholar and New York Times columnist, the Nobel prize in economics for his analysis of how economies of scale can affect trade patterns and the location of economic activity. Karl Wolfbrooks Ager, lead economist and founder of the FSRI (Faking Smart! Research Institute) had this to say: "Why we should concern ourselves with guns, butter and widgets during this period of financial free-fall is beyond me. You have to wonder if the Nobel committee has their heads screwed on right." When asked if this announcement had any implications on broader contemporary economic theory, Wolfbrooks was skeptical. "You've got a lot of economists out there and not one of them can tell you why this washing machine won't take my quarters. I got some BBQ sauce on my ascot last night and I've been here for the better part of a day trying to launder it. Ask Mr. Krugman what his theories are on that." Over the past several days the Nobel Institute has rolled out its much anticipated list of 2008 prize winners in fields such as physics, chemistry, literature and peace. Scholars are honored for the highest level of achievement in their respective disciplines. "Sure," added Wolfbrooks, "everyone wants a prize to stick in their office trophy case. Can't blame them. The question is... how much is this medal really worth? I think even Mr. Krugman would agree that it's all a matter of real vs. perceived value." Wolfbrooks noted that, with all the publicity the Nobel institute is receiving from this years list of winners, he was considering that the FSRI might try something similar. "We'll see. 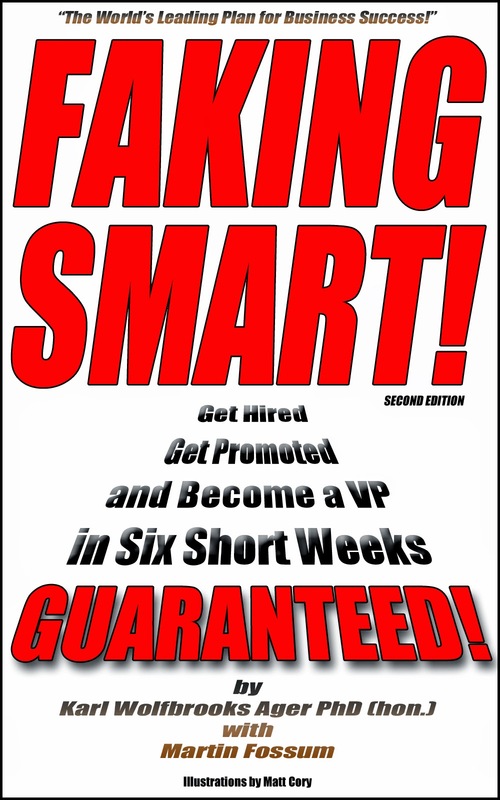 I guarantee that there are millions of people out there who would do just about anything to get a Faking Smart! award. I'll run it by our Promotions and Awards division and see if it's feasible." When asked what he was doing in Moose Jaw, Canada, Wolfbrooks appeared startled. "Canada?," he said. "Impossible!"